Thirteen-year NFL veteran Chris Draft, a former linebacker, has used his public platform as a professional athlete to meet needs in the lives of youth and to assist other players in areas of community development. Going starkly against the stereotypical grain amplified by the media, Chris Draft has dedicated his life to serving others. 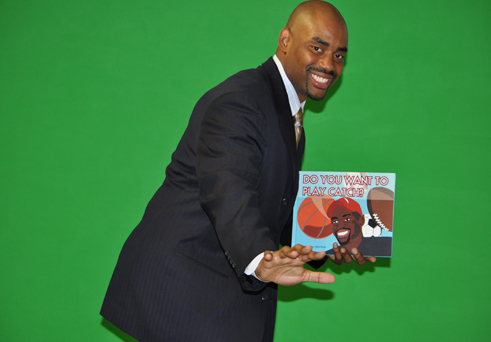 In 2006, he established the Chris Draft Family Foundation, a national organization that seeks to empower entire families to live a healthy lifestyle. As a young professional, Chris has already made a lasting influence in the communities of each of the NFL teams that he played for during his career. In fact, his work off the field and through his foundation has earned him numerous local and national awards, including the 2006 Walter Payton Man of the Year Award and the 2008 NFL Alumni Spirit Award. Chris continues his work of building holistically healthy families through his position as a national PTA Ambassador and through his work with First Lady Obama’s Lets Move! Campaign. Somewhere in his busy schedule, Chris found the time to author a children’s book entitled Do You Want to Play Catch? that has garnered him recognition as a featured author at the National Book Festival. Urban Cusp recently had an opportunity to interview Chris about his philanthropic endeavors and sources of his motivation. Urban Cusp: What is behind your motivation to serve communities? Chris Draft: When I was growing up, there was trash on the sidewalk. My brother and I would walk by the trash. My mom and dad would look at us and [ask] why [we] didn’t pick it up. “Well it wasn't my trash.” They weren't having that so the idea of seeing a problem and not doing anything about it means you are a part of the problem. That has always been a motivating factor. Now, having the platform of being a NFL player, I have to ask myself, what are you going to do about a problem with [this] kind of platform? UC: What brought about your foundation and what keeps you so active in it? CD: So many people have asked me, ‘Chris what does it take for my kid to go to the NFL?’ Too often they ask about football drills. They ask how fast [and strong] does my kid have to be. The foundation gives a different answer. From the beginning, we've said whatever you do, you do it the same way- responsible, disciplined, respectful, honest. UC: As a PTA ambassador, what have been some of the challenges working with the parents who really serve as the motivator for the students to get active? CD: I wouldn’t say that there are challenges as much as I would say that we need to incorporate the parents. If we want our kids to exercise and we want our kids to play sports, it’s important that at home the parents buy into it. If we talk to kids about the importance of nutrition, it’s important that the people who buy the food buy into that. If we talk about the importance of serving the community, we need the parents to buy into that. Parents lead the way. They've always been the most important role model. UC: Why do you think that we have a generation that is less active than previous generations and “inside all day playing video games”? CD: I think that problem when people say that is that they think that all things are equal. And you have somebody who is 66-years-old, and ask them about the video games they were playing, they didn’t have video games. You ask them about the TV they were watching and they couldn’t tell you. Ask them about the computer that they were playing with and they weren't playing on one. That’s why it’s more important now than at any time that our kids have the opportunity to exercise at school. Because when they get home, there are so many other things that are calling them. In most states right now, it’s not even required that students have Physical Education all four years. UC: Have you been able to see any progress from a policy level with any of the school systems you’ve worked with in terms of them re-initiating Physical Education and other activities? CD: There's definitely progress that’s happening all over the country. That progress happens when parents stand up and demand it. When parents are involved and they understand the importance of it, you don’t have to worry about it, they will have P.E. and recess. UC: What’s next for Chris Draft and how do you see the foundation evolving? CD: The basic idea was always to make it easier for other players to do more. We’re trying to increase our staff, increase our participation from the board, and be able to connect more players into the community. We want those guys who don’t know exactly what they want to do to have some meaningful experiences so that they’ll want to do more. Rev. Timothy L. Jones is the Associate pastor for Ministry Development and New Member Care at St. John’s Congregational Church in Springfield, MA as well as the Protestant Religious Advisor at Amherst College. After receiving his Bachelors of Art in Psychology from Amherst College, Timothy went on to receive his Master’s of Divinity with a specialization in Multicultural Theology from the Boston University School of Theology. Tim can be found online at SofiasDad.com.